Q: It is reported that a coach carrying 44 Chinese tourists crashed in southern Iceland on December 27, leaving one dead and many injured. Can you confirm that and give us more details? A: On December 27 local time, a coach carrying 44 Chinese tourists visiting Iceland overturned near the Vik village in southern Iceland, killing one Chinese national and injuring 11 others. The injured were taken to hospital for treatment. The Foreign Ministry and the Chinese Embassy in Iceland attach great importance to this. Our Embassy in Iceland immediately activated the emergency response mechanism, sent officials to visit the injured in hospital, contacted and asked the Icelandic side to do their best in treating the injured and carrying out a thorough investigation into the accident. Our Embassy also urged the travel agency concerned to take up due responsibility and properly handle follow-up matters. The Foreign Ministry and the Chinese Embassy in Iceland will continue monitoring the latest development closely and provide necessary assistance to our nationals in need. Q: The UN Special Rapporteur on the situation of human rights in Myanmar has called for international pressure on China and Russia on the issue of the Rakhine state, so as to try to get both countries to oppose the human rights abuses in Myanmar. What is China's response? A: China always maintains that differences shall be addressed through constructive dialogue and cooperation on the basis of equality and mutual respect. As the situation in the Rakhine state has gradually stabilized, and Myanmar and Bangladesh have already reached a repatriation agreement, any external pressure at this moment on the human rights issue will only make things more complicated, instead of helping ease the situation and solve the problem, which is not in line with the interests of Myanmar, its neighbors, and the international community at large. We hope that the international community could create an enabling environment for Myanmar to sort out the relevant issue. 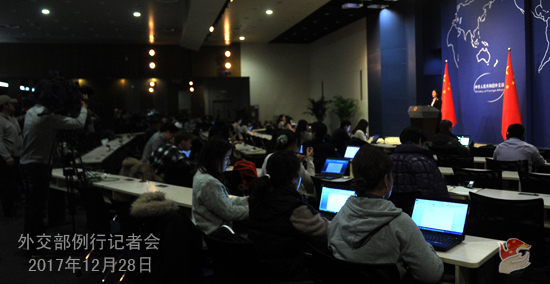 Q: Yesterday, the German and US embassies criticized China over the handling of right activists' case. What is China's response? A: China is a country with rule of law, and the Chinese judicial authorities handle cases in accordance with law. 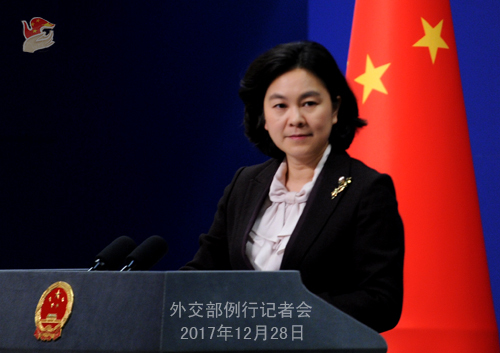 The individual countries you mentioned, by making such irresponsible remarks on our judicial authorities' normal handling of cases, blatantly interfered in China's internal affairs and judicial sovereignty. Their actions per se have violated the spirit of rule of law. China firmly opposes and will in no way accept that. 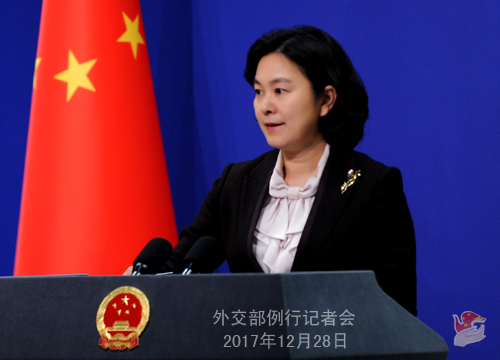 These two foreign embassies in China, as diplomatic missions, have no right to point fingers at China's internal affairs and judicial sovereignty. We hope the relevant embassies could accurately position themselves as regards their functions and do more to promote mutual understanding, mutual trust and cooperation, instead of the opposite. Q: On December 27, Russian President Vladimir Putin filed documents with Russia's Central Election Commission to run as an independent candidate for the presidential election in March, 2018. What is your comment? A: Russia's presidential election is its internal affair. We respect President Putin's own decision to run for re-election. Over the recent years, with President Putin at the helm, Russia has made continued progress in its national development. The China-Russia Comprehensive Strategic Partnership of Coordination, which has been moving forward at a high standard with ever-stronger development momentum, has yielded a series of important outcomes. China firmly supports Russia's efforts in maintaining national stability and realizing development and rejuvenation. We wish and also believe that Russia will have a very smooth presidential election.